Nowadays, calling someone a caveman is far from a compliment, but the truth is that cavemen understood life much better than we do. They did not have to work hard to stay in touch with nature; they were a part of it. That also means that their eating habits were far healthier than ours. With Caveman Foods, you can jump into a gastronomical time machine and go back to the times when food was made of… well, food, not artificial ingredients with zero nutritional value. In this Caveman Foods review, we will explore all the aspects of this exciting delivery service and offer mouthwatering descriptions of the delicious Paleo-inspired treats it offers. At Caveman Foods, you have all the freedom in the world to browse, add to cart, chuck out of the cart, rethink the quantity, browse again, and basically, buy anything you like and as much of it as you please. There are no limits, no obligatory subscriptions, nothing that would spoil your shopping experience. 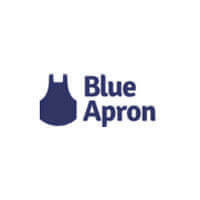 The products in the company’s offer include such protein-packed treats like chicken jerky, primal bars, nutrition bars, and infinitely satisfying Paleo-inspired bites. Everything is rich in valuable nutrients and made of completely natural ingredients. If you wish to receive the company’s Paleo delights regularly, you can also opt for a VIP subscription that you can tailor to your needs. You can decide on the frequency of the deliveries and choose to receive the treats every month or every other month. You can change the quantity at any time and you can skip or cancel whenever you please. If you find a new item you love and want to add it to your subscription, you can do so by selecting the product and choosing the Subscribe And Save option. As you can see, the shopping process is designed to be as simple as it can be in order to ensure maximum user satisfaction and provide an incredibly smooth shopping experience. Quite a lot, actually. First of all, Caveman Foods does not focus on meals but on all the tasty, crunchy, lovely treats and bits that you munch on in between breakfast, lunch, and dinner. It is hard to give up on snacks, which is why this company’s goal is to change the way you snack, so you no longer have to feel guilty for eating more than three times a day. What also makes Caveman Foods stand out is the quality of the ingredients and the suitability of its treats for a variety of special dietary needs. First of all, the ingredients are always non-GMO and the snacks do not contain gluten, soy, dairy, legumes or processed foods of any kind. Everything is Paleo-friendly and health-friendly as well. Another important distinctive quality of Caveman Foods is that it primarily focuses on meat snacks. This makes it perfect for carnivorous snackers who like their meat with a side of meat. 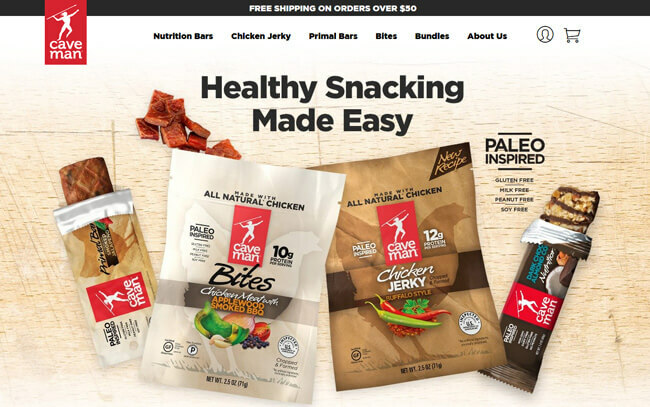 Previously in this Caveman Foods review, we briefly mentioned the snack types that this company offers, namely, nutrition bars, primal bars, chicken jerky, and bites. Now it is time to go into more juicy details. 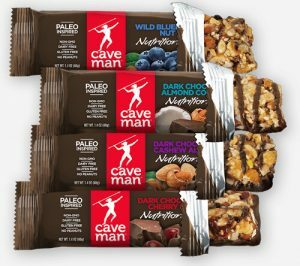 Nutrition bars are the only snack type offered by Caveman Foods that is not meat-centric. In fact, the bars are vegan-friendly and made of sultry dark chocolate, lovely cherries and blueberries, almonds, cashews, and seeds rich in protein. The calorie count per bar is 210 or fewer and the bars are free from soy, peanuts, and gluten. They contain no GMO ingredients. Primal bars are chicken-based treats enriched with all kinds of exciting flavors. You can enjoy smoked, uncured chicken bacon bars, chicken bars with mesquite BBQ flavor, chicken bars with smoked jalapeno or some sweeter treats like chicken with blueberries and pepper or sweet cherries. Primal bars are low in saturated fat and contain no preservatives or nitrates. Chicken jerky – the name says it all. Caveman Foods’ chicken jerky is Paleo certified, low in sugar, and contains no nitrates, preservatives or saturated fat. What’s more, it’s made of cage-free chicken. It comes in a variety of flavors, including buffalo style, Chipotle honey, and spicy. Caveman bites are bite-sized pieces of chicken meat enriched with fragrant, natural flavors of such delicious veggies like sun-dried tomato, habanero pepper, and green chili. They are low in sugar and contain no more than 200 calories per bag. In this section of our Caveman Foods review, we shall take a look at the prices of all products in Caveman Foods’ offer. Keep in mind that all the prices listed below are regular prices, without any discounts. As we have mentioned before, you get a 20% discount on all products with a VIP subscription. Nutrition bars normally cost $19.99 per 12-bar package. You can also purchase a 24-bar variety pack at the price of $39.99 or a 30-bar pack of mini bars at the price of $27.49. All varieties of chicken jerky cost $69.99 per 12-bag package. Chicken jerky variety packages cost $69.99 per 12-bag package and $99.99 per 18-bag package. Primal bars cost $29.99 for 12 bars. Primal bar variety packs cost $29.99 per 12-bar pack and $99.99 per 18-bar pack. All kinds of Caveman bites cost $69.99 per 12-bag pack, except for Sweet & Smoky Chicken Bites, which cost $27.49 per 12-bag pack. Variety packs of Cavemen bites cost $69.99 per 12-bag pack and $99.99 per 18-bag pack. Caveman Foods ships nationwide and it even makes deliveries to US military addresses. It currently does not offer international shipping. 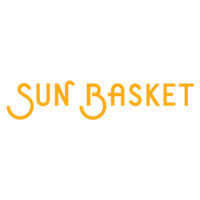 Its products can also be found in stores around the country, as well as in some retail locations in Canada. You can easily find the nearest store that features Caveman Foods products by using the Store Locator on the company’s official website. For orders of $35+ shipping is free of charge. However, keep in mind that this is only true for locations within the continental US. To make sure Caveman Foods meets all your standards and expectations, it is important to know its biggest advantages and disadvantages. With a short overview of its pros and cons, you can easily decide if Caveman Foods is the right company for you. Caveman Foods allows you to enjoy something you may have thought to be impossible: guilt-free snacking. All Paleo-inspired treats in its offer are completely natural, free from all the ingredients your body does not need, and what is equally important, they are downright delicious. Another great aspect of Caveman Foods service is that you get 20% off all products with a subscription and you do not even have to pay for the shipping if your order is worth more than $35. Talk about the ultimate snacking experience. Our ratings are the result of an objective and independent evaluation of Caveman Foods, generating the final rating that reflects the overall quality of the company. Ratings may change as the service changes. Caveman Foods customer rating based on 4 customer reviews. The bars are so delicious. HOWEVER, while placing an order on their website I used a 15% discount code qhich took my 39.99 down to $34. Shipping was free on orders over $35. After the discount code applied the site cha ged my price to $45 with a fed ex shipping charge added. I did not complete my order because I found this tactic to be unethical. I didn’t expect everything to be so tiny, but I have to say they’re worth the money, really delicious. Whenever we plan a guys’ night, we order from Caveman Foods. Super cool snacks. We found 0 verified Caveman Foods discounts for April, 2019. There are no Caveman Foods coupons or discounts right now.